Designer Anuradha Raman’s work is all about fusion of weaves, embroidery and prints. Anuradha uses colours generously too. One can see a lot of fun in her designs with the use of colours like turquoise, mustard yellow, fuschia pink and lemon yellow. “For me, the essence of my collection lies more in the colour and the combination of prints and embroideries that I use,” says she. Her latest collection comprises sarees, dupattas, kurtis and churidars. While using ikkat, kantha and Kutch cotton, along with Venkatgiri silks, Anuradha has also used a blend of traditional Indian textiles with modern cuts giving them a fresh look. She says, “To attain the desired design, a variety of stitches and styles have been mixed. Over the past few years, I have tried to revive the lost Indian textile industry which has so much to offer. I get the weavers from states like Andhra Pradsesh, Bengal and Gujarat and with their help try to make my collection unique. 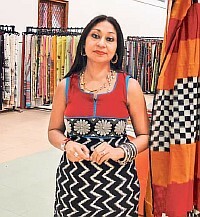 I specialise in the Telia Rumal sarees and the Tussar and Malda silks,” says Anuradha. One can also see the ageless tie-and-dye technique from Pochampali, Chirala, and Puttupaka villages of Andhra Pradesh coming back to life in her sarees.